Blowout Sale! 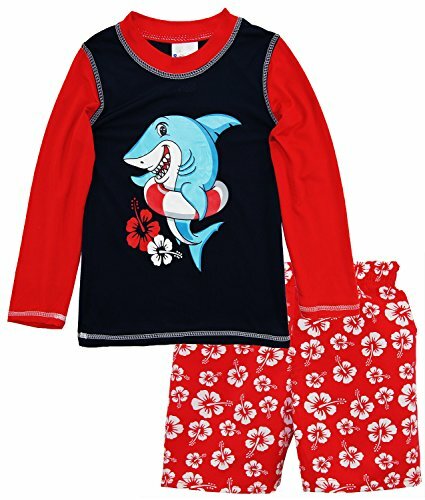 Save 53% on the Sweet & Soft Little Boys Shark Long Sleeve Rash Guard Hibiscus Swim Trunk Set, Red, 3T by Sweet & Soft at SCRHI. Hurry! Limited time offer. Offer valid only while supplies last. Two-piece shark set with long-sleeve rashguard and swim trunk. Raglan-sleeve rashguard with shark at center. All over hibiscus print on swim trunk. Two-piece shark set with long-sleeve rashguard and swim trunk. Raglan-sleeve rashguard with shark at center. All over hibiscus print on swim trunk. Swim trunk has mesh lining, elastic waistband for secure fit. Rash Guards feature super fun print but more importantly will help prevent at least a few of those summertime scratches and sunburns. Contrast color stitching throughout body. Zig zag stitch pattern. Certified UPF 50+ protection. Two-piece shark set with long-sleeve rashguard and swim trunk. Rashguard with shark at center. All over hibiscus print on swim trunk. Swim trunk has mesh lining, elastic waistband for secure fit. Certified UPF 50+ protection. A fun way to prevent at least a few of those summertime woes! If you have any questions about this product by Sweet & Soft, contact us by completing and submitting the form below. If you are looking for a specif part number, please include it with your message.